Kenneth Cordray and Lewis Vaughan struggle just to get this big guy to move at all. Clark DiMaio looks on. Kenneth is now doing a complete line of alligator taxidermy. Click on the title link above for more details. If you want the entire animal caped, it will look like this photo and include head and feet. From a caped skin, you can do a rug mount or a full body mount. Or you can order a just head mount with the skin or a skull mount, European style. Here Tristan Cordray joins Kenneth and Lewis for a long day of working on this big guy. It took over 6 hours to skin and debone it! I've added a few more pictures from the big gator today to the Big, Bad & Unusual page. Mark Merting landed this 12 footer! 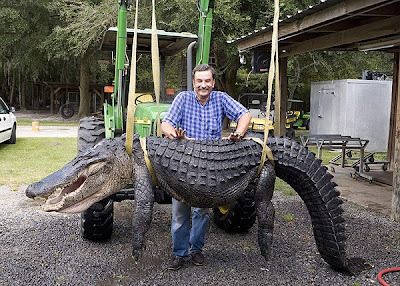 We don't know what the record for alligators is - we know there's been a 13 footer - but this one's got to be close! If you've ever swam in Lake Moultrie, near Russelville, he might have accompanied you. It took 2 hou rs to get it landed and our tractor to get it out of the boat! Even though part of its tail was missing, it measured 12 feet 2 inches long. They've been skinning since about 12 and are still hard at work! Will post a few more pics later today. Click on the title link of any blog post to see more! This one's from the Cumbahee. Wiley Murph, Bryan Bolt, and Glenn Adcock got an 8 and 1/2 foot alligator early this morning. They were hunting the Cumbahee River. We might see them again, as they've got 2 more tags to go! John Hollis brought in the first one, 8 ft. 4 inches. John said the alligator was down under a dock. Just for kicks, he thought he'd try to call them like they do on TV. He moved the boat out a few yards and started the weird throat call. That gator turned and began swimming right towards them! So you heard it here first, you CAN call in gators to your boat! We'll keep you updated all weekend on what we're seeing come in. We're opening for a few hours tomorrow, Sunday, from 7:30 am to 10 am to take in gators. Then we'll reopen at the regular time on Sunday evening at 6 pm. Notice how the gator's packed in with ice bags and rolled up in a tarp. That's just how to transport them to keep the meat safe. Ice down your alligators and come in the morning! You guys are worrying me! We've had a bunch of calls about bringing alligators in at 2 am, 3 am, etc! I know we always preach about getting deer cooled really quickly, but alligators are a little different. Since they are cold blooded creatures, they are the temperature of the water they're in. So when you get one during the night, lay a tarp in your truck and pack him in with several bags of ice. Roll the whole thing up like a big burrito, and then you've got plenty of time to bring him in. DNR suggests starting to cool them within 4 hours. We'll be open tomorrow, Saturday, at 7:30 am. We are usually closed on Sundays, but plan to open up early to take in gators at 7:30 to 10 am. Then we'll reopen as usual at 6 pm. Stay tuned to this blog for pictures and information! If you have questions, add them as comments here and we'll do what we can to find answers for you! I prefer not to call it a "disorder." It's a talent! I've talked here about my goats. Now you can see them on the news! Well, not mine, but some of their talented cousins. Click here for fainting goat video. Our estimates from alligators we've done in the past are that a 10 foot alligator will give you about 40 lbs. of meat. We can slice it, grind it, or run it through the cuber for you, package it in 1.5 lb. vacuum sealed bags, and freeze it for you to pick it up in about 10 days. As with the venison, we charge per pound. So makes sense that we will retrieve all the good quality meat possible from the animal. That's been one of our foundational principles at Cordray's. Whether it's deer or hogs or beef or now alligators, we have an obligation not to waste the products of the animal. We feel strongly that part of our stewardship is to use all the usable portions of any animal harvested. You'll hear that the only good meat on an alligator is from the tail, but that is not the case. With care, you can get a sizable return of good quality meat. Wash and remove seeds from the bell peppers. Slice the bell peppers into thin strips. Drain the juice from the can of hot n’ sweet peppers. Combine bell peppers and hot n’ sweet peppers. Place a combination of the peppers into the center of a piece of cubed steak. Fold the meat so that the peppers are completely covered by the meat (you are essentially stuffing the cube steak with peppers by wrapping the meat around the peppers). Wrap the pepper stuffed cubed steak with a piece of bacon and secure it together with a toothpick. Place each piece of wrapped meat into a sealable container. Cover the meat with the Italian dressing and Worcestershire sauce. Let the mixture marinate for up to 3 hours. Grill the meat wraps until the cubed steak is done and the bacon is crispy. Great recipe for beef or venison! Click on the title link above for more recipes. Send us yours by commenting to this post. We'd love to hear from you. What do I need to bring in with my alligator? Please post your questions about the upcoming alligator season and we'll try to get them answered. This one came in by phone. Every alligator must have the numbered tag attached to the tail. DNR says: Only alligators four feet or greater in length may be taken. Be absolutely sure you've read all the information that you got with your tags, because we will not be able to take anything in that is less than 4 feet or that is missing that tag. The next biggest "thing" you'll need to bring is the decision on whether you want to keep the hide or not. If your alligator hide is in excellent shape, you may be able to trade the hide in for the skinning/caping fees. Visit the complete Gator page to learn about pricing. To be able to trade the hide, it will need to be in excellent shape. So be sure not to cut the alligator on the throat or underbelly. If you do, your hide is ruined and you won't be able to trade it for the skinning fees. The value of hides you trade in to us in the underside of the animal. the shooting of unsecured alligators, even on private land. and brought boat-side or onto land before it can be dispatched. So be sure that you don't "dispatch" yours anywhere but on the back at the base of the head, so you won't ruin the hide! If the hide isn't in excellent shape, you can't trade it in for the skinning fees. 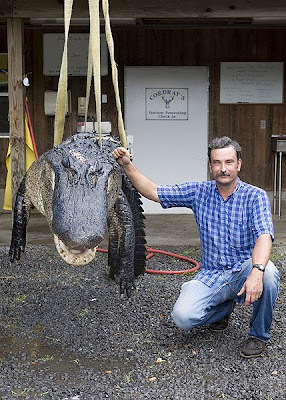 You'll need to pay for the skinning or caping before we can take in your alligator for processing. Stay tuned for more information on the difference between a caped or skinned alligator! We are beginning to set up to do alligators for the upcoming new alligator season. Private landowners are already bringing in a few big ones. We've been working on alligators for over 5 years, but haven't done it on a big scale for the public. We want to provide the same excellent service that we do for deer, so bear with us as we work out the kinks! There are 2 different ways to bring in alligators. 1. You get the meat and head. You trade the hide in for the skinning fee. As with venison, you'll pay for it when you pick it up. 2. You get the hide, head, and meat. On alligators, you'll need to know what you want to do with the hide and pay for the skinning or caping BEFORE you leave it. So if you are going to send someone in with your gator and you want to keep the hide, you'll need to send your payment along, too. The decisions on caping or skinning the alligator have to be made before we ever put a knife to it, because the value of the hide to us and to you is all in how it's handled. If we cape it and then you change your mind, the hide's worth nothing to you or us. So be prepared to decide and pay for what's done with the hide when you bring the gator in! For more information, click on the title of this post. We've hit the ground running after Hannah! But luckily not from this guy! Buddy Touard brought in 2 nice gators to start off our work with processing these big lizards. Daniel Postell helped Michael get them skinned. The rest of the day was wild hog mania. I don't know if the storm got them rolling, but we had some pretty big ones! Tonight, Sunday, was more of a buck night with a nice 10 point being brought in by Brian Mizzell. Click on the title bar for more pictures.